A beautiful custom alloy called Robonuim. This alloy is a custom blend I have created for tension setting. It is a warm pink/peach color. This ring has two tension set stone in a coil style. The large stone is a Madagascar Sapphire and the smaller stone is a Diamond. 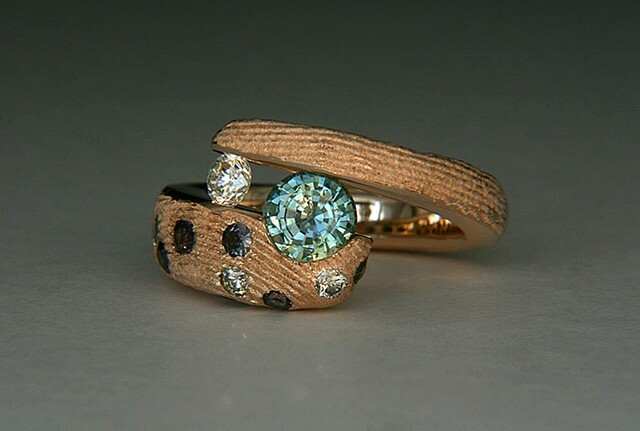 The accent stones are Diamonds and color change Garnets. Please contact me if you have interest in a ring like this one or a custom consultation for your own creation.